Runners in warmer climates must think we are crazy here in the colder states. When the temperature drops well below freezing, many of us still go out and run. I’m no exception. In fact, I took up running in the middle of winter a couple of years ago. I didn’t even really have the “right” gear. when I started. My first day out it was about 20 degrees (Fahrenheit) and had snowed a couple of days before. I threw on some cheap track pants I had gotten on clearance at Target a few years prior (that previously I had worn as around-the-house pants), a long sleeve t-shirt, a REI fleece jacket, and a knit beanie. I had just gotten some Newton Momentum running shoes on the recommendation of a friend and was eager to try them out. I think I ran for about a mile. I was drenched from head to toe in sweat and had slipped several times on patches of ice and slick snow. I was a mess, yet in no way deterred. Eventually, I got wise and got better winter gear slowly along the way. In fact, I’m still learning a bit about the right clothing and layers based on temperature, speed, and distance. That said, having the right stuff really does make all the difference in the world when it comes to staying warm and feeling dry. I’m pretty picky about my features and brands when it comes to this stuff as I now have had the experience to know what works for me. Also, a good portion of what I have is hand-me-downs from a friend who grew too skinny for them. He is equally picky, if not more. Nike Element Half-Zip (Top Layer) — I have a few of these and swear by them. Running Room Thermic Crew Neck (Base Layer) — I have a couple of these. Very good at keeping you warm and transferring moisture away from your skin. Nike Element Thermal Running Tights — When it comes to clothing, I have a lot of Nike gear so you will notice it as a recurring theme. The Element line fits great, performs great, and looks great. Smartwool Men’s PhD Running Light Micro with ReliaWool — Yep, a have a half dozen or so pairs of these as well. When I find something that is good and works, I make it a sensible default. Nike Lightweight Wool Running Hat — Here is the updated model of the beanies I use. This is better and I will likely get a couple of these next I need them. So, That takes care of things to a certain temp, but what when it is really cold and the temp drops below 5 degrees? Well, add more layers of course! Nike Element Thermal Men’s Running Pants — Love these things. LOVE! Nike Element Shield Men’s Running Jacket — They actually no longer make the jacket I own but this is the closest next-best-thing. Saucony Drylete Balaclava Hat — Does the trick. Yaktrax Run Traction Cleats for Snow and Ice: Sports & Outdoors — These stretch onto your regular running shoes and are lightweight and durable. Highly recommended. So, there you have it. 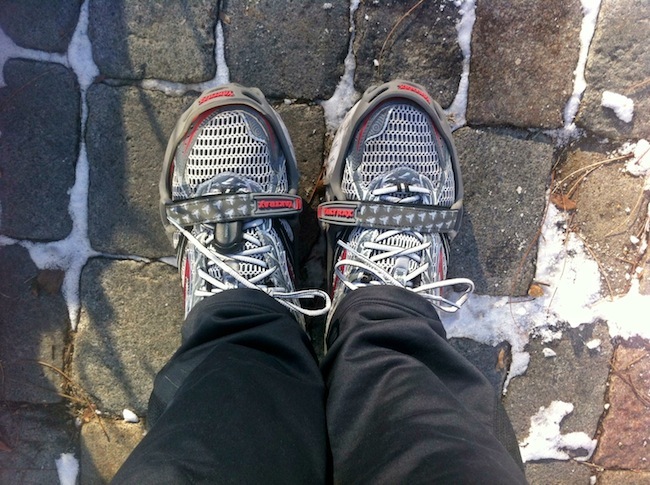 Don’t let cold weather be an excuse for not getting in a good regular run. With the right gear not only is a doable but it can be just as fun. Your free will donation of any amount helps to support a full-time independent writer. Thanks for reading!